Please note that the content of this book primarily consists of articles available from Wikipedia or other free sources online. 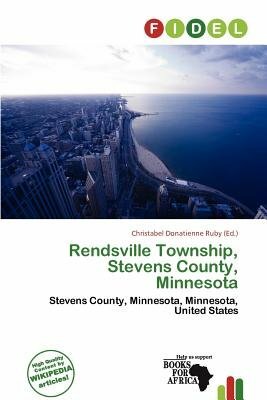 Rendsville Township is a township in Stevens County, Minnesota, United States. The population was 177 at the 2000 census.According to the United States Census Bureau, the township has a total area of 35.0 square miles (90.5 km ), of which, 34.4 square miles (89.0 km ) of it is land and 0.6 square miles (1.5 km ) of it (1.66%) is water.As of the census of 2000, there were 177 people, 67 households, and 55 families residing in the township. The population density was 5.1 people per square mile (2.0/km ).